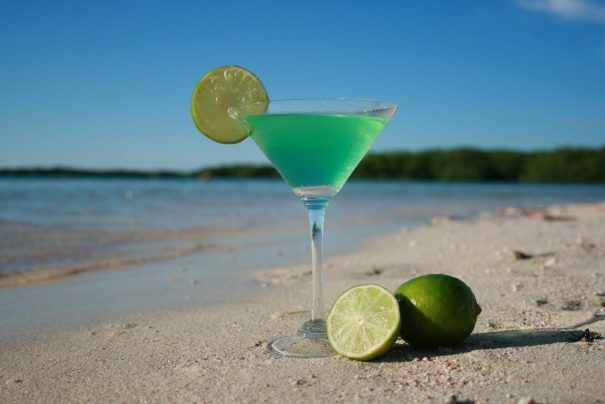 If your trip to Bonaire can’t come any sooner, maybe a Green Bonaire cocktail will ease your pain for a while. The taste of Bonaire is undoubtably Cadushy of Bonaire Liqueur, a vibrant green cactus liqueur produced locally by Cadushy Distillery in Rincon, Bonaire. Visitors to Divi Flamingo Beach Resort & Casino should make an effort to stop by Cadushy, the only distillery on the island. It makes a different type of specialty liqueur for each of six islands in the Dutch Caribbean, as well as rum, vodka and whiskey. You can sign up for a tasting and learn first-hand how the spirits are produced. If you have a little Cadushy of Bonaire on hand, try mixing up the refreshing Green Bonaire. Pour all spirits into a ice-filled cocktail shaker. Add some apple juice and just a touch of blue Curacao to enhance the green color. Shake and strain into a cold martini glass. Add a few drops of fresh lime juice. Garnish with a slice of lime. Here’s to Bonaire! We hope you can come visit soon! Previous Post4 Experiences You Must Have in ArubaNext PostHappy Thanksgiving from Divi Resorts!